We have determined that, in rare cases, when the power adapter included with the UK Fire 7” and UK Fire Kids Edition 7” tablet is pulled from the wall socket, the adapter assembly may detach and create a risk of electrical shock. Affected adapters were sold only in the United Kingdom and Ireland from September 2015. Customer safety is our top priority, and we are proactively offering to replace these power adapters with a new adapter, free of charge. We encourage customers to exchange their original power adapters using the process below. Please discontinue use of your original adapter. Until you receive a replacement adapter, you can use the included USB cable connected to a computer or another compatible adapter to charge your tablet. To find out if your power adapter is affected, compare your adapter to the images below. Power adapters sold in other countries and power adapters shipped with Fire HD and Fire HDX tablets are not affected and need not be exchanged. There are two options for replacing your adapter. We can send you a free replacement adapter OR apply a £12 credit to your Amazon account so you can purchase a power adapter of your choice. Whichever option you select, we will be sending you a pre-paid return envelope so that you can send back your original power adapter. 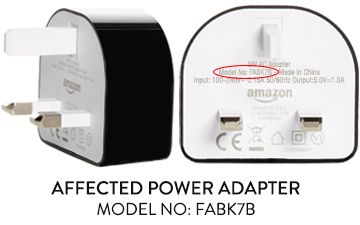 Please contact Customer Service at www.amazon.co.uk/contactus if your power adapter appears to be damaged. Click the Add to Basket button below. Apply claim code NEWADAPTER in the box marked “Gift cards & promotional codes” on the final checkout page. Your discount will be reflected in checkout. Please note the power adapter replacement ships within 4 weeks. Posted by Mr. Bloggy on 05/03/2016 in Alert, Amazon, Health & Safety, Immigration Scam, News, Precaution, Product Recall, Public Warning, Safety Warning and tagged Advice, Alert, Amazon, Dangerous Product, Latest Crime Reports, News, Product Recall, Products, Public Warning.